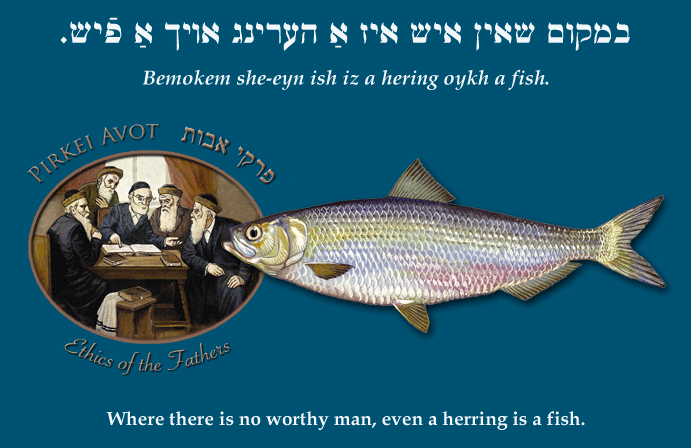 Yiddish Wit: Where there is no worthy man, even a herring is a fish. במקום שאין איש איז אַ הערינג אויך אַ פֿיש. Bemokem she-eyn ish iz a hering oykh a fish. Where there is no worthy man, even a herring is a fish. In a place where there are no worthy men, strive to be worthy. На безрыбье и рак рыба. | If there is no fish, even crawfish is fish. The two references are playfully linked through the rhyme of ish ("man" in Hebrew) and fish ("fish" in Yiddish). As Benjamin Harshav explains in The Meaning of Yiddish, the Yiddish proverb substitutes herring, which is kosher, for the unkosher crawfish or crab in the Russian proverb, but both species are considered "poor man's food." Coarse, everyday herring, writes Harshav, is not considered real fish because it cannot be used to make gefilte fish for the Sabbath. But if the ideal is not available, we make do with what we can get. Harshav notes that this expression is often used by a self-effacing speaker as if to say, "In the absence of a worthy man, you will have to accept me instead." If there is no fish, even herring is fish.